Children are often surprised to understand the words as they read them after doing some Brain Gym activities. Learning is about doing. 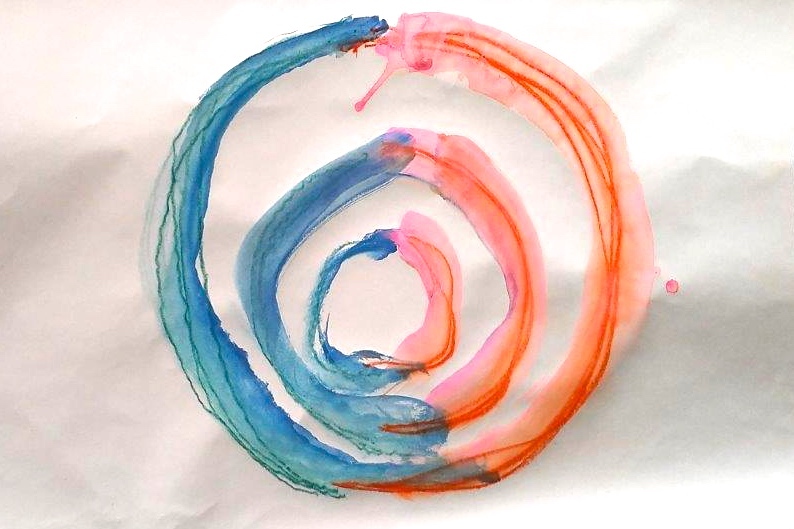 Children become self-initiating learners when they connect or re-connect with the movement patterns that call them into action. As a reading teacher once indoctrinated in the idea that learning is a mental activity, I first wrestled with this paradoxical point of view in the early 1970s. I saw struggling learners at my reading centers make their biggest leaps in reading, writing, and processing language, not through repetition and memorization, but by mastering physical (sensorimotor) skills related to the integration of perception and action. Over time, I developed a system, Educational Kinesiology: Seven Dimensions of Intelligence*, based on a simple principle: Create learning opportunities so that students can connect with the physical skills. I helped learners discover how to integrate their movement patterns in terms of left-right, up-down, and back-to-front directions. I further found that by prioritizing these dimensions I could more readily create a teachable moment for engaging skills of centralization, spatial awareness, holding a tool (like a pencil) effectively, and so on. Gail and I in 1986, during our early days of co-teaching. I asked my friend and colleague, Gail Hargrove (later to become my wife), to help me organize my processes into a course manual. We soon found that it was our great joy to teach the work together. 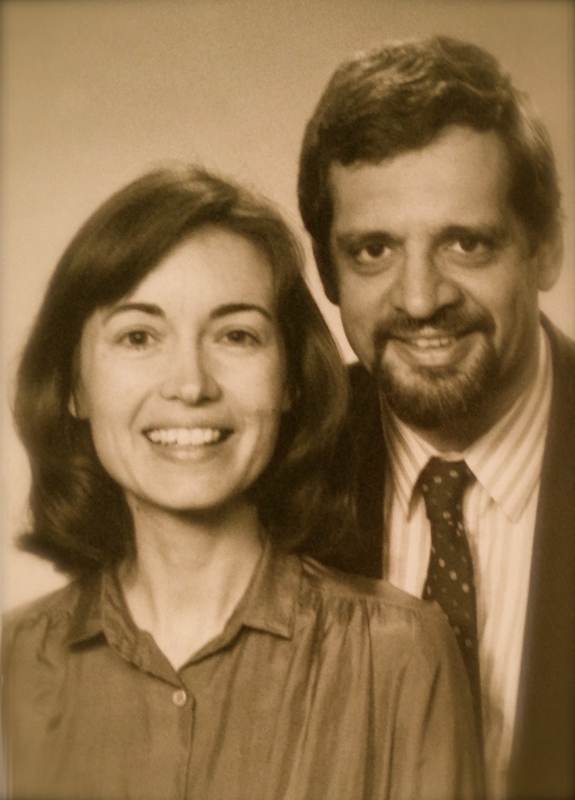 In the early 1980s, Gail and I began teaching throughout Europe, Canada, and the United States. We often stayed over for a few days in one location to give private consultations. 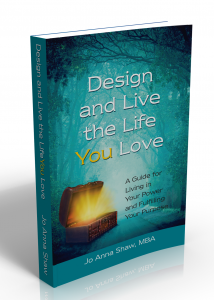 We would end each session by showing a few self-help activities from our repertoire that would take just minutes to do and serve as reminders of the goal, drawing stick-figure illustrations. We chose movements that re-enforced any skills of balance, coordination, eye-teaming, and centralization learned in the session. We found that repeating these each day helped students to anchor new habits of movement, learning, playfulness, and self-calming. One afternoon in the spring of 1986 we had the good fortune to work with a woman, her husband, and son Danny*. 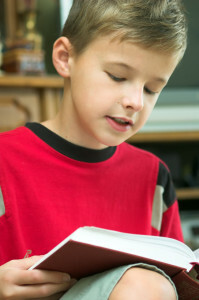 Danny’s mother expressed her goal for him to improve his reading. When asked what he would like to learn to do more easily, seven-year-old Danny said that he wanted to be able to catch a ball better (he had been diagnosed with a mild cerebral palsy, and his movements were somewhat restricted). While we were doing the Edu-K in Depth menu with him, Danny improved his hand-eye coordination with his right, previously shortened and “useless,” arm, which through muscle-relaxing activities now extended to the same length as his left. Along with his mom, we joked around with him as we played catch with a crumpled paper “ball” and asked Danny to write his name and draw a picture. By the end of the session, Danny’s eyes had come to life and he read fluently and with comprehension for the first time. His mother listened with tears streaming down her face. We laughed and chatted with Danny, confident in our good rapport, for we had become pals. My thoughts continued in this vein. 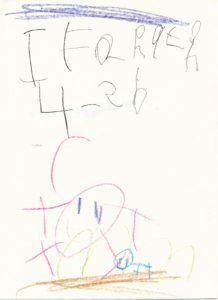 In the context of the educational system of the ’70s and ’80s that referred to learning challenges as “minimal brain dysfunction,” and perhaps anticipating the ’90s and “the decade of the brain,” and further, given my understanding of cognitive science and the relationship between learning and movement, the name “Brain Gym” came to me. Gail and I both immediately liked the name. “Brain Gym” clearly speaks of what our work is all about: bringing together the thinking intelligence and the coordination of the body. 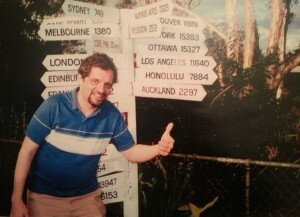 Gail took this photo of me in Brisbane on our first trip to Australia and New Zealand. Gail and I envisioned putting our best activities into a small book that we could give away to students as “homeplay” after a private session, and began working on that project. Our booklet, Brain Gym: Simple Activities for Whole-Brain Learning included 26 easy-to-do physical movements that enhance learning. A few weeks later, we sent our paste-up version to the printer, just as we boarded a plane to teach our first courses in Australia and New Zealand. 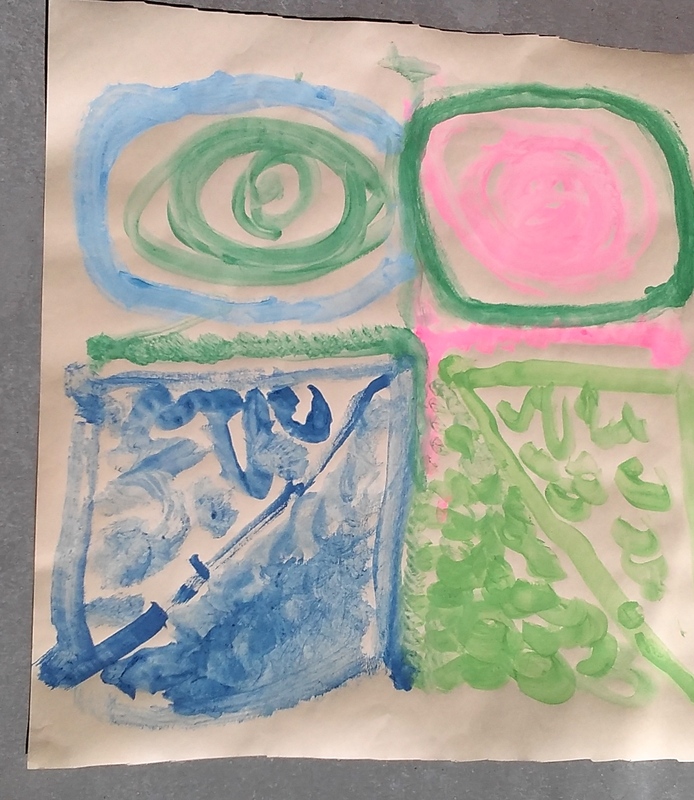 A draft of the booklet went with us, and as we shared it with students, we suddenly saw that these quick and simple activities could become as important as our in-depth work. Soon after, we reworked some of our course material into what is now Brain Gym 101: Balance for Daily Life, which included the activities. *Educational Kinesiology in Depth: Seven Dimensions of Intelligence, uses a priority system to explore left-right, up-down, back-to-front directional movements, as well as motivation, breathing, self-regulation, and cranial movement (habits of teeth and jaw). For more about how Paul chose the Brain Gym activities, see Freedom in Learning: The Gifts of a Child-Centered Education. **Danny is not his real name. This story is excerpted from Brain Gym and Me: Reclaiming the Pleasure of Learning, by Paul E. Dennison,©1986. ***The Brain Gym activities are described in depth, along with suggested applications, in Brain Gym®: Teacher’s Edition, by Paul and Gail Dennison, ©2010, Edu-Kinesthetics, Inc., Ventura, CA. Inspiration for the activities was drawn from many sources, including Developmental Optometry, dance, long distance running, child development, the postural work of F.M. Alexander, the Touch for Health process, and our own inventiveness. More and more, we realized the value of this collection of movements that so effectively facilitate learning, enhance the enjoyment of daily life, and help individuals attain more of their potential. Brain Gym® is a trademark of the Educational Kinesiology Foundation. Click here for the name of an instructor near you. Gail and Paul do “The Give and Take” from the Integrated Movements menu. Our thanks and congratulations to the board, staff, and all who are coming together to move, play, and share in this year’s 4-day June event in Portland, Maine. 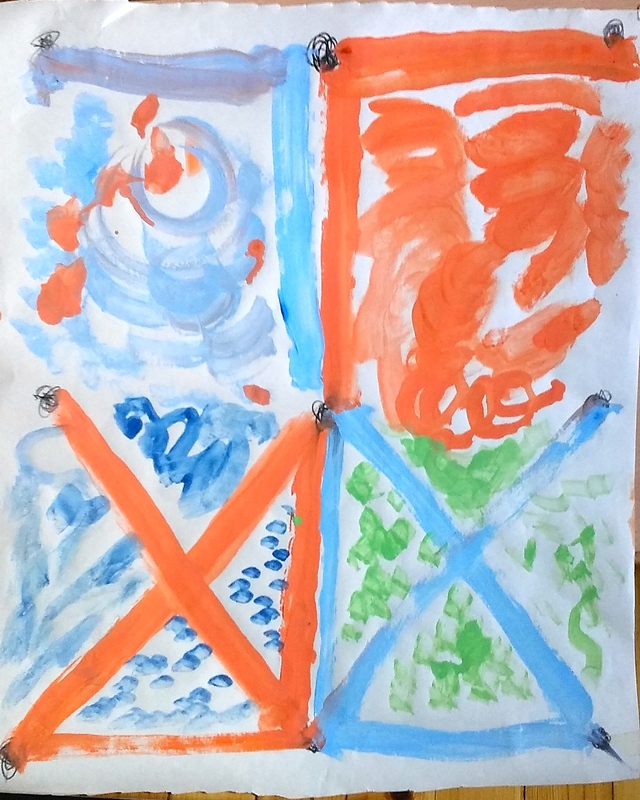 The theme—“Port of Potential”—with its invitation of holding new possibilities for our lives and exploring “all things capable of becoming real,” is an invitation to explore the arts, wellness, movement patterns and sensory skills, business development, and much more. As we envisioned an annual conference, we saw the value of developing the profession of Educational Kinesiologist. Our dream has come true as our language of learning through movement has been validated and recognized by educators, kinesiologists, physical therapists, occupational therapists, and many neuroscientists across the planet. Edu-K and the Brain Gym program represent excellence and professionalism. We’re proud of all of you and extend our humble gratitude for your steadfast loyalty over these many years. The two of us, having attended 25 plus Edu-K conferences over the years—beginning in 1989 at Murrieta Hot Springs, California—know these gatherings as rich opportunities to connect with dear, longtime friends worldwide and to meet new ones, exchange Edu-K balances, and deepen our inner listening to the needs and desires for our own lives. We’ll be thinking of all of you as you call upon your dreams and visions and discover new ways to embody them; we are with you in spirit and we’ll be calling in our own. Carla Hannaford (presentation title yet to be announced), is an award winning biologist and educator, and an inspiring and knowledgeable speaker. The author of four books, all of which have been translated into many languages, her work is quoted in more than 1,000 books and journals. She is the creator of the Physiological Basis of Learning/Brain Gym series of courses and a Visioncircles Teacher Trainer. Dr. Hannaford is truly a pioneer of learning through movement, having taught in 48 countries world wide. Dionne Kamara, “Jamaica Brain Dance – Laying the Groundwork,” is a teaching artist in NYC, where she works with people of all ages. She began learning traditional Kumina dances, under her great-grandmother’s tutelage, as a child in Jamaica. A professional dancer for many years, she has toured internationally with the renowned dance company Urban Bush Women. 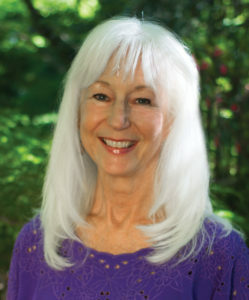 She co-teaches with her mentor Anne Green Gilbert at the Summer Dance Institute for teachers in Seattle, Washington. We were moved to read of the many other innovative professional development presentations and breakout sessions that have been scheduled—many of them being given by leaders who first became Brain Gym Instructors in the mid- 1980s. We would love to thank each of you by name; since the list is long, you can read it here. Click here for information on post conference events. 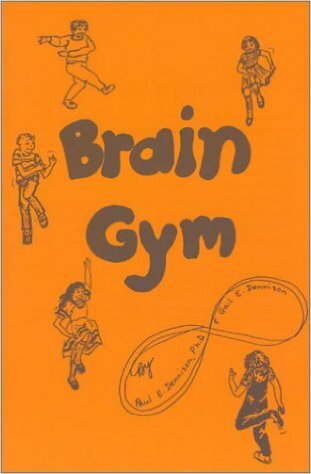 This year we celebrate the thirty-year anniversary of our little orange book, Brain Gym: Simple Activities for Whole-Brain Learning, written initially as a “homeplay” handout for Edu-K students. 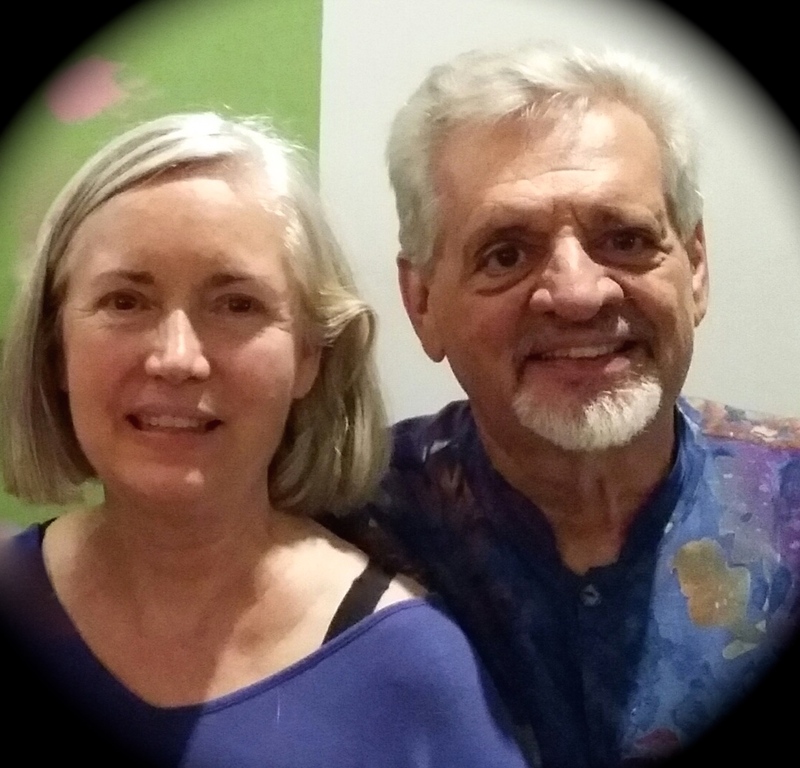 Paul continues teaching local courses here in Ventura, California, and taught this spring in Belgium, France, and Switzerland. This fall, he’ll travel to Japan for the third time. Click here to read about his course last year in Dubai. 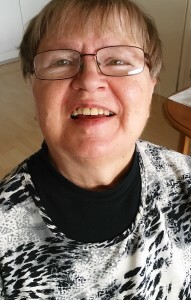 Meanwhile, Gail continues working on blogs, digital product updates, and our latest book project. As we continue to grow the presence of Brain Gym and Educational Kinesiology in the social media (Facebook, Twitter, and LinkedIn), we appreciate these avenues as a grassroots opportunity to update parents and educators with the latest research on movement, play, and learning, as well as a way to connect with so many of you. Thank you for your support! Where Edu-K once pioneered the field of movement-based learning, there are now many “move to learn” programs. The 26 Brain Gym activities, the Brain Gym 101 course, Seven Dimensions of Intelligence, and our other fine courses remain unrivaled in scope, simplicity, and a regard for the learner through self-actualizing activities. Research in neuroscience continues to catch up with our commonsense recognition of the interrelationship of the human body and optimal brain function. 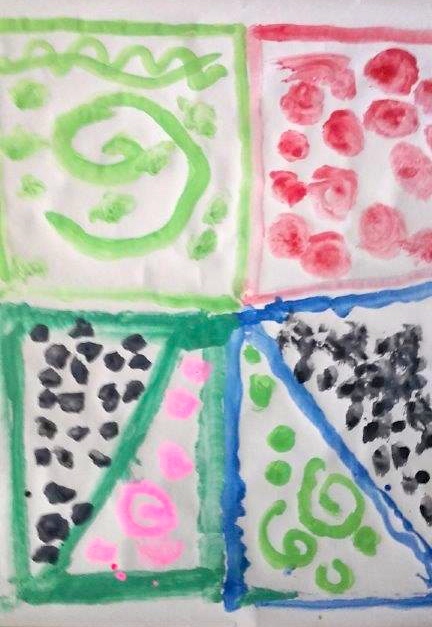 Please connect with us through our learning resource site, Hearts at Play: Move, Learn, Bloom, that offers blogposts and videos to answer many of the how, what, and why questions about the Edu-K work that you’ve asked us throughout the years. We trust you’ll find this site useful in creating immediate interest in your courses and private sessions. May we all keep finding balance as we progress in our personal and professional goals, and may we all keep moving with joy! For more about the Edu-K approach to whole-brain learning, see Paul’s article: Why I Chose Research Over the Ivory Tower. 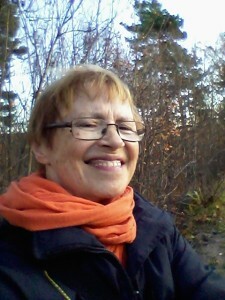 Liisa Korhonen, Brain Gym Instructor and psychologist, Helsinki. Ritva’s first Double Doodle (Dec, 2014). 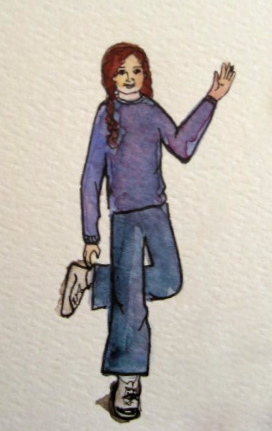 While Ritva draws with her left hand, Liisa motors her right in a mirror-image. For our Double Doodle process, I choose sturdy paper, 56 x 65 cm in size. 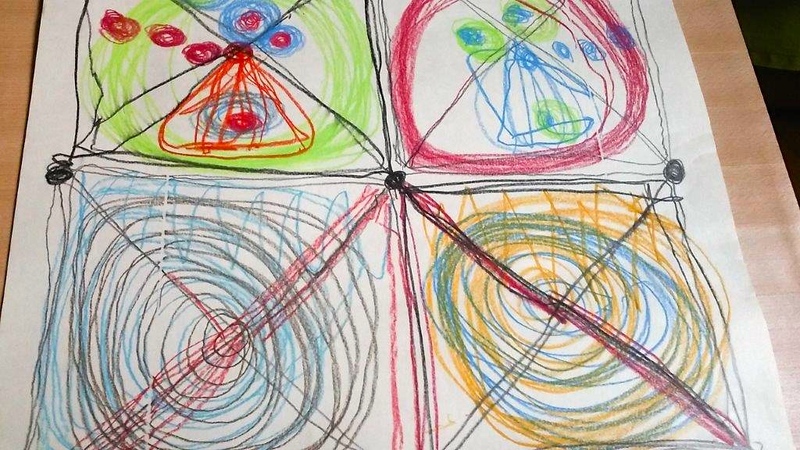 While Ritva uses the crayon or brush in her left hand, I motor her right side to mirror what she draws. 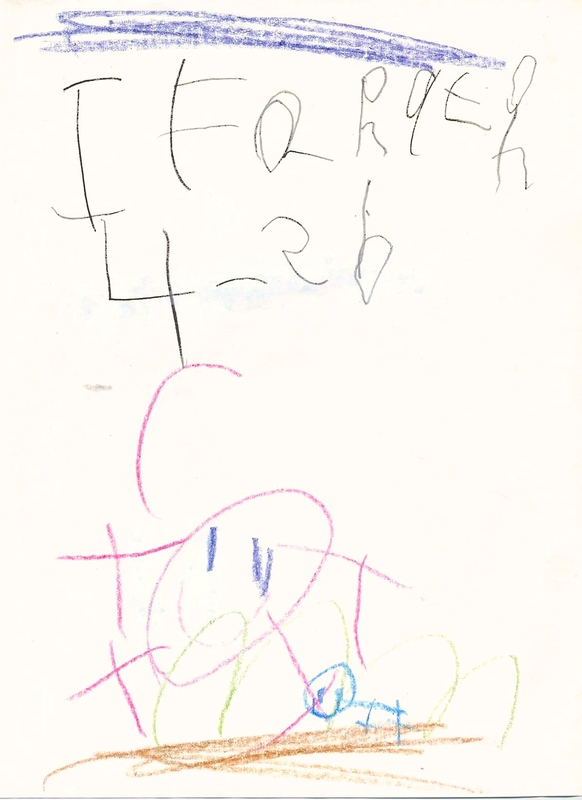 Now I could better see the importance of mark making as stated by Gail Dennison in the Double Doodle Play manual. In this case, I’d say that the most constructive activity has been Ritva’s and my collaborative planning and executing of movement. This first picture (right) is from December 2014, and we have doodled together on and off ever since. 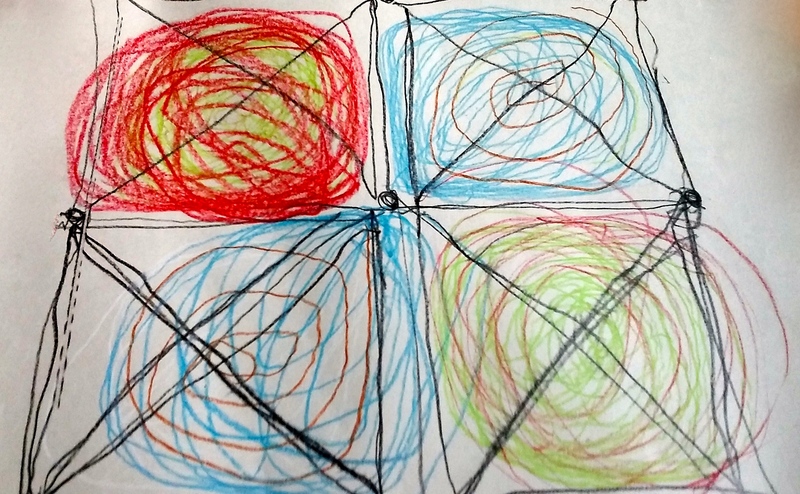 Ritva drew this while playing the Double Doodle “Nines” game for the first time. Our next step was the Nines, with both of the images at left drawn in February 2015. 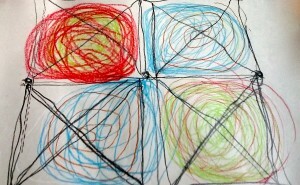 To do this, I first put nine symmetrical dots on the paper, then we start negotiating the directions. We do half the paper like that, then I turn the paper around in order to ease the strain of Ritva’s right arm and we do the other half. Ritva’s contributions are seen diagonally in the final products, as in the examples at left. For a time, the emotional aspect of mark making became dominant. 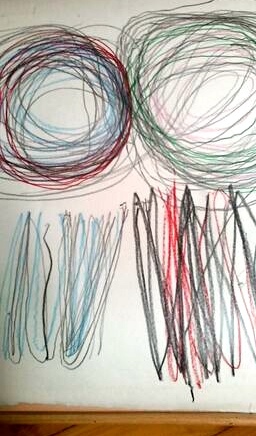 Ritva became self-critical and, since she wanted to avoid negative moods, her willingness to doodle subsided. Ritva begins a more playful exploration in this 2nd image based on “Nines” (both from Feb, 2015). ”Why does the changing of letters raise so much feeling?” asked a reporter when Finnish television showed the latest change of model letters for schools. The letter designer referred to the lifelong personal experience of using letters in handwriting. Writing really creates an intimate relationship with marks and letters, and through them with the whole of human civilization, as Gail says in the manual. After my experience with Ritva, I would even view the emotional development as an aspect of its own right in the Double Doodle process. Ritva’s playfulness becomes more apparent in Harmony of the Nines (May, 2015). In May, our use of big brushes and poster paints brought positive changes to Ritva’s Double Doodle process. As you can see, the paintings had become more harmonious. This harmony of the Nines was accompanied by a generally positive mood. If Ritva felt lonely during the day and phoned me to complain, she always accepted my response that she was the only person who could control her feelings. According to her friends, her Emotionalese has recently become more nuanced. 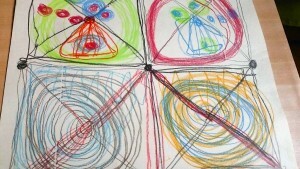 Ritva Korhonen discovers new ways to express herself using Double Doodle Play. 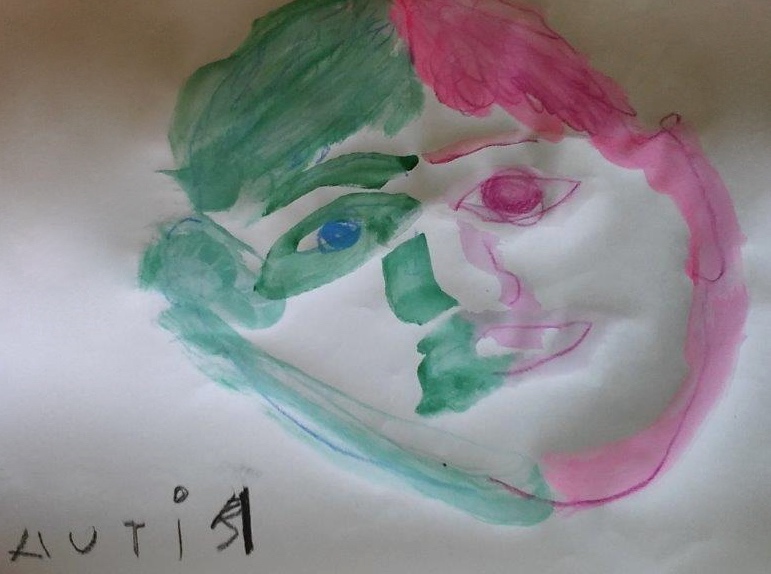 In July, with Liisa’s assistance, Ritva paints her first portrait‚ one full of expression. In July we made our first portrait of a face, which became quite expressive. 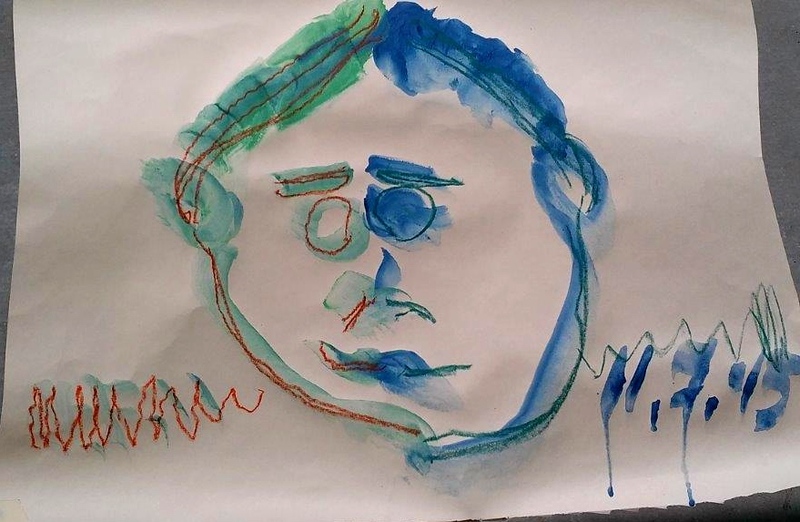 It was my birthday, and we were both in the best of moods, which reflects on the face we drew. The July Nines also show the changes to be consistent. I’m happy to report that the balancing effect of Double Doodle Play stays in Ritva’s moods, even if we don’t have time to doodle very often. I think that the pleasure of looking at beautiful objects—all objects, actually, continues to increase for her, as it does for me. Thank you from my heart, Gail and Glenys! 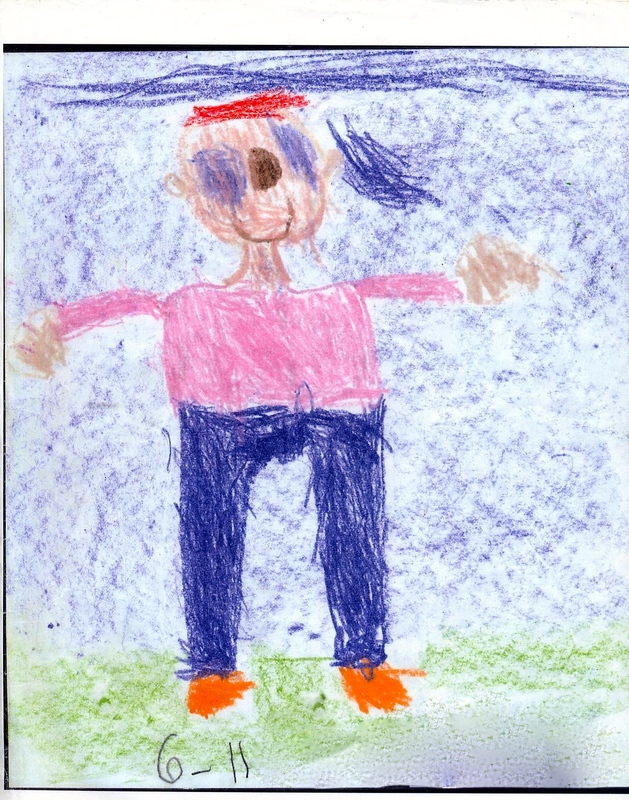 The Double Doodle is one of 26 Brain Gym activities, from Brain Gym: Teacher’s Edition © 2010, by Paul and Gail Dennison. For a translation of this article into Italian, click here. Brain Gym® is a trademark of Brain Gym® International/The Educational Kinesiology Foundation. Click here for the name of a Brain Gym or Double Doodle Play instructor near you. It’s a Bonny Day for Dancin’! 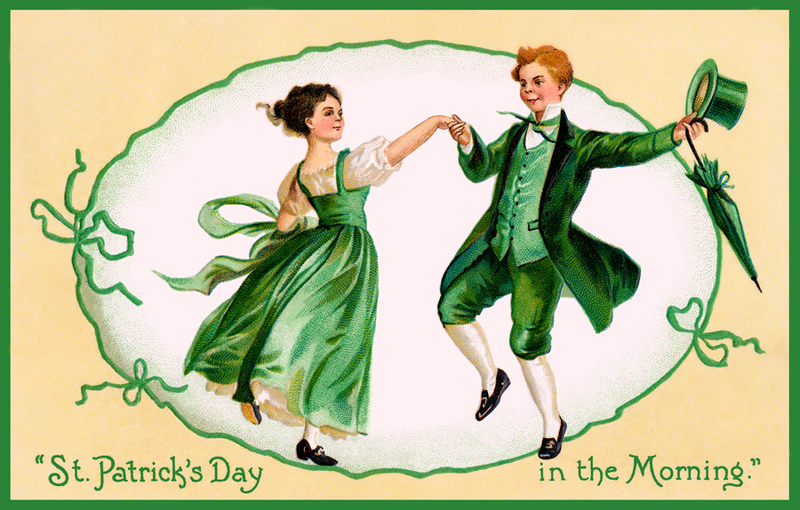 Top o’ the morning to ye, and it’s a bonny day for dancin’! In spring or anytime, I find that dance is a lovely way to increase my vigor and celebrate my day. It’s difficult to dance and not feel happy and light-hearted, plus dancing a complex pattern is great for your memory. Dance may have evolved from people’s seeking a social way to make merry after a day’s work, or to mark the end of a season. Perhaps you enjoy, as I do, such fervent dances as the Irish or Highland jig, or more choreographed forms like contra dance, English Country Dance (perhaps driven by the lilting sound of a tin whistle! ), or the festive grapevine or even modern Western square dance. Central to all such Western and European folk dances is a rhythmic and alternating left-right shifting of weight, similar to the Cross Crawl(1) activity from the Brain Gym program. Once you’re familiar with the Cross Crawl, you can vary it to do many dance steps, including a version of your own Irish Jig. You just need the right music, or perhaps you’ll sing or whistle along. Let the children join in, and have a dance party! How to: You can build your Cross Crawl jig from a common jig dance step—the rising step or rise and grind. Dancers use the phrase hop, hop back for the first three movements (#1). The complete step is called the hop hop back, hop 1234 (#1 – 3). Do this first with the right foot leading, then with the left foot leading. 2. Then shift your weight onto your right foot, leaving your left foot in the air. Pause slightly. 3. Now alternate with small hops, in place, from foot to foot in the pattern of left-right-left-right, ending with the weight on your right foot. For a fun variation, you can do this same pattern while lifting the foot to the back, as in the Hopscotch (pictured above). You might know that the real jig is done with the feet turned out, one in front of the other. However, I suggest keeping both feet pointed forward, hips-width apart, and parallel, as most of us who have been sedentary folks at some point in our lives don’t have the length and strength of posterior muscles (calves, hamstrings, hips . . .) to dance with toes turned out, which would then put a strain on our hips and back. In all cases, according to biomechanist Katy Bowman(2), the feet need to be pointed straight during walking in order for the ankle to actually work like an ankle (in its correct plane of motion), for the knee to work like the hinge-jointed knee that it is, and for the lateral hip to be engaged. And especially without posterior strength, walking, dancing (or even running) with feet pointed forward helps to protect us from significant stresses throughout the posterior kinetic chain, which could otherwise over time result in frustrating conditions, such as flat feet, bunions, misaligned knee and hip, and the potential injuries these can cause. *Paul and I have been teaching people to do the Cross Crawl for more than 40 years. Click here to discover more about the many benefits of the contralateral Cross Crawl on movement and learning. (1)The Cross Crawl and other Brain Gym activities are from Brain Gym® Teacher’s Edition, (C) 2010, by Dennison and Dennison. If you have difficulty doing this movement (it does require some coordination), you can easily learn it through a brief repatterning, available from Brain Gym Instructors (see below). 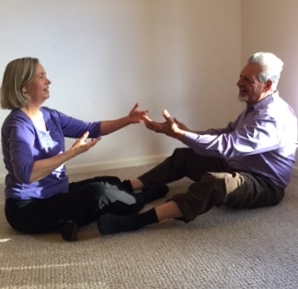 Further, many Brain Gym Instructors teach the Cross Crawl in a dance-like form, or you can enjoy a whole day with more than thirty variations of the Cross Crawl offered in the Movement Dynamics course that I developed in 1990 (see course listings at the same link). Here are more tips on how to do a jig. See the video review “All About Your Knees” on the work of biomechanist Katy Bowman to learn more about the mechanics of foot position and how this can affect knees. See also Alignment Matters: The First Five Years of Katy Says, by Katy Bowman, M.S., 2013. © 2013 and 2016 by Gail E. Dennison. All rights reserved. Brain Gym is a trademark of Brain Gym® International. Click here for the name of an instructor in you area.